The Kennedys, an 8-part miniseries originally commissioned as History Channel's first scripted drama, has finally found a television home. It will premiere Sunday, April 3rd on the still fledgling ReelzChannel, the network announced Tuesday. History Channel made a surprise decision in January to reject The Kennedys after its executives viewed the finished product. In a statement, the network said, "While the film is produced and acted with the highest quality, after viewing the final product in its totality, we have concluded this dramatic interpretation is not a fit for the History brand." Several other cable networks, including Showtime and Starz, also passed on The Kennedys when it was offered to them. ReelzChannel CEO Stan E. Hubbard, whose network could use a big burst of publicity, said in a publicity release, "We believe in the business we are committed to -- movies, the celebrities making them and how and why they influence our cultural universe. If that means defending the right for well told and important stories to be seen -- then so be it -- we can do that . . . As an independent, we have the freedom few networks enjoy." 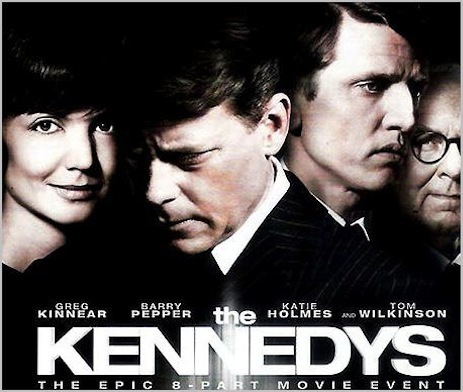 The Kennedys has a prominent cast, including Greg Kinnear as John F. Kennedy, Katie Holmes as Jacqueline Kennedy, Barry Pepper as Bobby Kennedy and Tom Wilkerson as Joseph Kennedy Sr. While the miniseries was still in development, detractors branded it a right-wing hit job based on readings of leaked scripts. The Kennedys' executive producer, Joel Surnow, is an outspoken conservative who formerly helmed Fox's 24. But History Channel executives said the miniseries had been revised and vetted for accuracy before filming began. Below is a trailer for The Kennedys, in which Wilkerson's family patriarch says at one point, "This country is ours for the taking."